The University of Phoenix Stadium in Glendale, Arizona, is a cultural hub for the greater Pheonix metropolitan area, playing host to a variety of events throughout the year. The Arizona Cardinals play professional football here, and the annual Fiesta Bowl is played here every year as well. Additionally, when Arizona is lucky enough to win a Super Bowl bid, this is where it takes place, and when it is their turn to host the College Football National Championship, it will take place at this stadium, too, and from time to time you'll also be able to attend trade shows, monster truck rallies, and other special events here as well. When it first opened in 2006 the stadium did not have a name sponsor, and it was referred to as Cardinals Stadium. Now, it is often called as UOP Stadium. Although there are 63,400 permanent seats, for special events—such as the Fiesta Bowl and the College Football National Championships—seats are added to make a total of just over 72,000. The University of Phoenix Stadium has a retractable roof and field, and it was the first stadium in North America to be built with a retractable field of real grass. Another fun fact: The outside skin of the stadium was designed to look like a barrel cactus while murals inside the stadium depict the canyons, deserts, mountains, and rivers of Arizona. 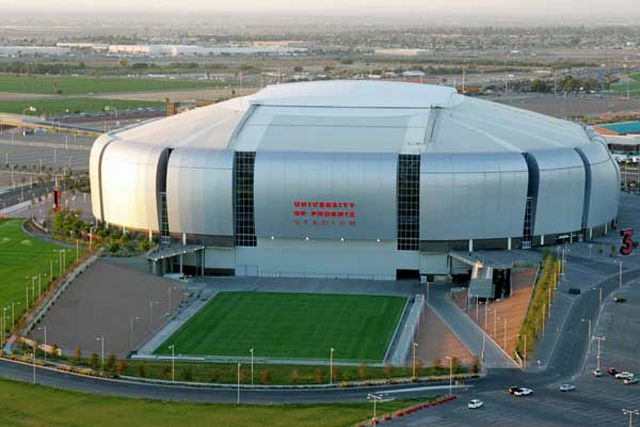 The University of Phoenix Stadium is located in Glendale, Arizona, in the West Valley. Glendale is adjacent to and just west of Phoenix, but unfortunately, this stadium is not accessible by Valley Metro Rail. 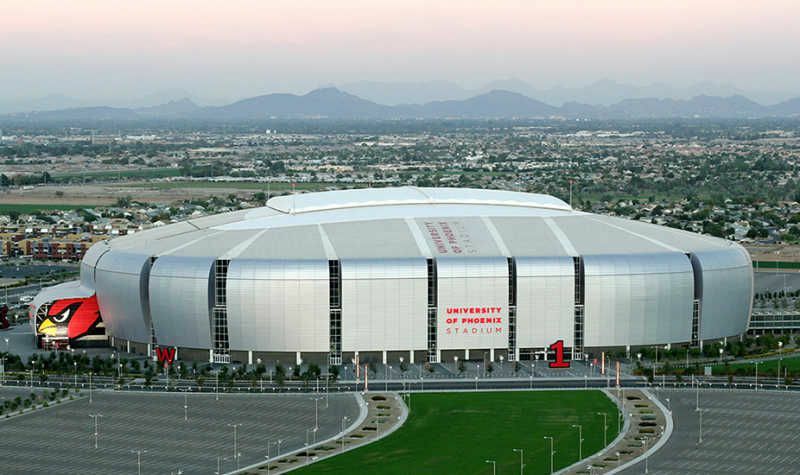 You can try to access the stadium by taking the bus, but if you are staying in Scottsdale or Downtown Phoenix you'll probably need a car to get there. However, it is within walking distance of the Westgate Entertainment District, which offers a chance to go to the movies, eat out at local restaurants, drink at local bars, and attend many free family-friendly events during the year. If you're driving from the south, take Loop 101 north to Glendale Avenue, and then make a right (east) onto Glendale; the University of Phoenix Stadium will be at 91st Avenue, on the right. If you're coming from the north, take Loop 101 south to Glendale Avenue, and then make a left (east) on Glendale Avenue until you hit 91st Avenue. Finally, if you're traveling from Scottsdale or downtown Phoenix, take I-10 west to Loop 101 north until you see signs for the University of Phoenix Stadium (on your right). Those who live in the area can go directly to the University of Phoenix Stadium Box Office, located at 1 Cardinals Drive in Glendale. Once you get there, you'll need to walk to Gate Number 2 on the northeast side. When there are no games or events taking place here, there is no charge to park at the stadium, and the Box Office is open Monday through Friday as well as for a few hours on Saturdays. Otherwise, tickets can be bought online from Ticketmaster or from ticket exchange sites like StubHub. On game days or event nights, there are always scalpers outside the stadium, but be careful not to get scammed if you choose to buy tickets this way. If you are traveling to Arizona and want to stay in the Phoenix area, there are quite a few places within walking distance of the stadium. The Renaissance is a hotel and spa just a few steps from the stadium; otherwise, the closest upscale resort is The Wigwam, which is about seven miles away in Litchfield Park. After the game or the event you're attending at the University of Phoenix Stadium, make sure to check out the local attractions nearby. Westgate Entertainment District has restaurants, bars, free concerts, movies, and family festivals year-round. Meanwhile, serious shoppers will want to check out Tanger Outlets while outdoors enthusiasts can browse Cabela's. Gila River Arena, which are all located right across from the University of Phoenix Stadium. Also, be sure to check the concert line-up or the game schedule for the Arizona Coyotes NHL Hockey if you want to schedule events all weekend long. Courtesy Arizona Cardinals, may not be reproduced without permission. Shown here is the general seating configuration for University of Phoenix Stadium. Seats may be added or deleted, usually in the end zones, at their option. For concerts and other events verify the stage placement with the ticket seller. To see a larger version of the image above, simply temporarily increase the font size on your screen. If you are using a PC, the keystroke to us is the Ctrl + (the Ctrl key and the plus sign). On a MAC, it's Command+.